At the beginning of the school year, we set a goal for PTA membership at 100% participation through our parent and teacher community. 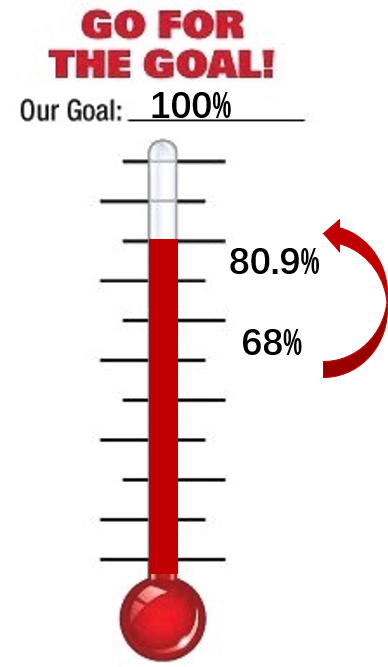 As of today, we are at PTA membership at 88% overall participation. As for membership within our teacher and staff community, we are at 67% participation. By becoming a member of our PTA, you join a group of people committed to improving the lives and education of our children. Please take five minutes today to Join the Medina PTA and sponsor our teacher and staff. Membership form can also be downloaded HERE and turned into PTA box at school office. We are part of the National Parent Teacher Association® (PTA) which is the oldest child advocacy organization in the United States. The National PTA provides parents and families with a powerful legislative voice to speak on behalf of every child and the best tools to help their children be safe, healthy, and successful—in school and in life. Your membership is your voice (legislative voice) for the children of Medina Elementary. The more members our PTA has, the more voting delegates we receive at the state level. More voting delegates means more votes that support the interests of Medina Elementary and its families. Our kids are worth the investment and a strong PTA illustrates our community’s support to our school and children. PTA members have access to many benefits and discounts to businesses such as Avis Car Rental, Barnes & Noble, Budget Car Rental, Great Wolf Lodge, KeyArena/McCaw Hall, Wild Waves 0 Enchanted Village, and many more. See extended list at Washington PTA webpage. Join our PTA and you join a group of people committed to improving the lives and education of our children. We need your help, your ideas, your skills and your financial support!